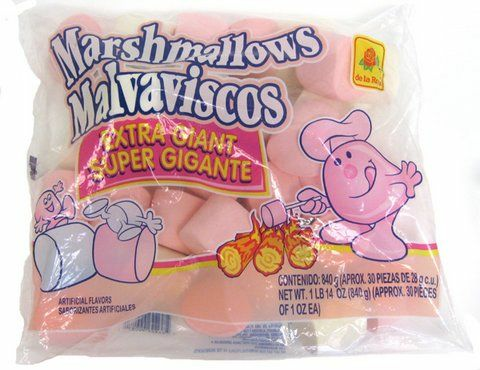 Extra Giant- dimensions 3"x 3" Pink and white marshmallows from Mexico. A De la Rosa product. Bombon, Malvaviscos, Bon Bon, Bonbon. De la Rosa's Extra Giant Marshmallows are some of the largest & most delicious sweets you'll ever find. The marshmallows come in 2 flavors: strawberry and vanilla (pink & white), they are so fluffy & sweet you just can't stop eating them. Even before you taste De la Rosa's Extra Giant Marshmallows their sweet aroma emanates from the bag, making you crave these delicious treats. These extra giant marshmallows are also great for a variety of desserts: smores, rice crispy squares, with ice cream, roasting or eating them regularly out of the bag. De La Rosa's Marshmallows come in the perfect size for you to enjoy! Ingredients: sugar, corn syrup, gelatin, corn starch, wheat starch, artificial flavors (strawberry, vanilla), artificial color (titanium dioxide and red 40), sodium propionate (preservative). Los Bombones Extra Gigantes De La Rosa son los dulces mas grandes y deliciosos que puedes encontrar. Los bombones vienen en dos sabores: vainilla y fresa (blanco y rosa), son tan esponjosos y dulces que no podras dejar de comerlos! Incluso antes de que puedas probar los Bombones Extra Gigantes De la Rosa el dulce aroma te llega de la bolsa, provocando tal antojo que no podras evitar comerlos. Estos bombones extra gigantes son perfectos para una gran variedad de postres o para comertelos asi como vienen en la bolsa. Ingredientes: azucar, jarabe de maiz, gelatina, almidon de maiz, almidon de trigo, sabores artificiales (fresa, vainilla), color artificial (dioxido de titanio y rojo 40), propionato de sodio (conservante). i just want to know if the gelatin used in it is pork based ? I was shocked to see marshmallows this size! I was so excited to show my 3 year old (that thought the typical large marshmallows I buy at the store were huge)! He was so happy! He loves them and so do I! How cool and yummy! The strawberry is so good! Boy were they nice and fresh and very good. The De la rosa Marshmallows were simply amazing. The marshmallows were by far the best giant marshmallows I've had in the past week. Also, the marshmallow juices were tantalizing. The marshmallows remind you of a simpler time when marshmallows were as big as your fist. Also the softness of the marshmallow takes you back to a simpler time when marshmallows were made with real care and love.